Launched in 2000 in Copenhagen, Second Female creates feminine and sophisticated easy-to-wear essentials, designed in a beautiful palette of soft colors and refined prints. Underlining the Scandinavian values of effortless luxury and functionality, we create collections that are classical in a contemporary context, always focusing on this season´s “must have” items. Signature silhouettes include feminine blouses, everyday dresses and fashionable knitwear. Our design philosophy and aim is to create a relevant wardrobe that embodies all the comfort and confidence, a woman needs to express her personal appearance. Just Female is a skandinavian contemporary ready-to wear brand with a clean approach to design based on a sophisticated core. We base our values around our ambitions to create a contemporary brand that believes in dissecting seasonal trends and mapping out where clean and contemporary fashion is heading. We inquisitively work to create easy-to-wear styles that have the ability to shift between day and night. Founded in 2002 by designer and creative director Trine Skoller, Stella Nova makes four annual collections. – or get carried away with an edge from top to toe. The journey of Twist & Tango started in 1995, in Gothenburg, Sweden. With the vision of creating a brand for women with an effortless and timeless approach to modern fashion and to design high quality complex collections combining everyday fashion with ease and style. Each year, two main and four seasonal collections are presented through a wardrobe perspective including a wide range of styling possibilities. Significant for the brand is its Scandinavian minimalism and simple designs mixed with in-house developed prints represented through the characteristic core values fun, simple, personal and feminine. Norms also making up the mentality and spirit of the brand, creating a steady foundation to evolve with. ACCESSORIES BRAND BASED IN COPENHAGEN.THE UNIVERSE IS SIMPLE, URBAN,PLAYFUL AND EVERCHANGING.BUILDING ON A MINIMALISTIC DANISH DESIGN TRADITION. gloves, leather bags and small goods to our complete footwear collection. We create original prints inspired by fashion and the world around us, with care. All, while focusing on making it affordable for you! Behind TomShot is a team of 12 built around founder and designer Thomas Schwender. The story begins in the late 1990's. While studying in Paris, Thomas started creating his own line of fashion jewellery under the name of Tosh-Accessories. This became a huge success. As a result he concentrated fully on his own designs. In 2001 Thomas brought his brand to the heart of Berlin by opening his own shop with connecting design studio. Due to demand, in 2005 he added a second shop in Berlin. Changing the name to Tom Shot in 2009 brought a re-direction in his designs to focus on intricate jewellery pieces. Even today, every piece of TomShot jewellery is handmade by our own craftsmen in the Berlin studio. Most recently the business has grown to incorporate its own online shop. With two collections per year, TomShot design is constantly developing itself to focus on the latest trends which are reflected in both, the design, the materials and the finish of each handmade item. Seven Boot Lane is a Somerset based family-run footwear brand established in 2012. 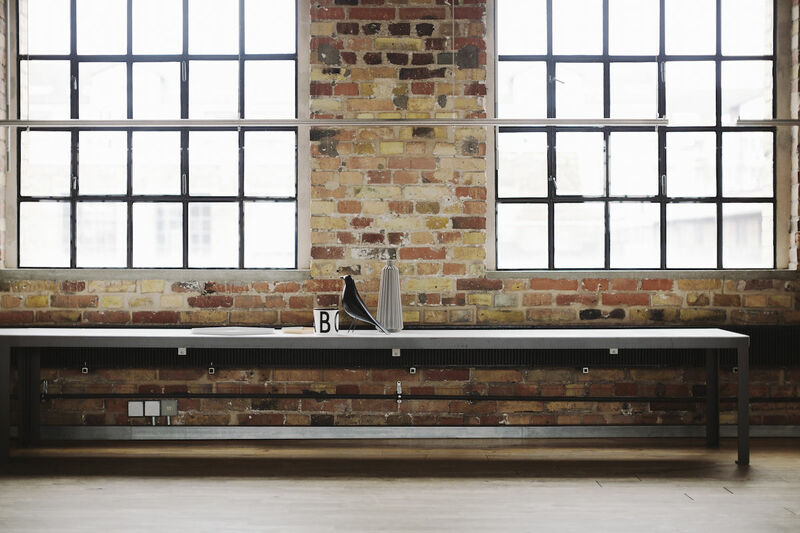 As a small independent business, they celebrate a considered approach to production and design. Never dictated to by trends, Seven Boot Lane’s aesthetic remains focused on producing sophisticated, seasonless collections, which become the modern woman’s wardrobe staples. The brand was borne out of a desire to honour the notion of ‘slow fashion’ and support independent businesses, from the family of Spanish craftsmen in Elche through to their ongoing collaborations with boutique stockists worldwide. skillful and trusted workmanship paired with a desire to push the boundaries of footwear design. The in-house design team is constantly driven by their passion to seek out new materials and finishes. Never one to compromise style over substance, Seven Boot Lane is mindful of its concise and uncompromised brand narrative. The path taken over the years is the synthesis of stories, experiences, and feelings that have helped to translate simple thoughts into ideas and such ideas into a finished product. Art as a reference, always being a guide and an inspiration of a greater vision, has contributed to an increasingly mature stylistic phase and the conception of a thought that is balance, the need for simplicity and search for the essential detail. Art, as source of inspiration in the search of beauty and harmony of shapes, in order to give life to creations capable of exciting, only as great works of art can do. A vivid curiosity put at the service of every day’s work. A project unrelated to the hottest trends. A style ever-evolving from a timeless idea. The passion was born in 1975, in a small garage, thank to Michele and Anna, two young people that had the first idea and now still are the company’s owners. In the new company generation there are Graziana, Antonella, Angelo and Massimo, who actively take part in the business processes. There are specific skills combining a special mix between scholastic and corporate trainings. From one generation to the following one, they preserve all techniques and tailoring traditions, constantly adding the research applied to the product. Icoman has important partnership with international important fashion brand as it has been maker for many years. 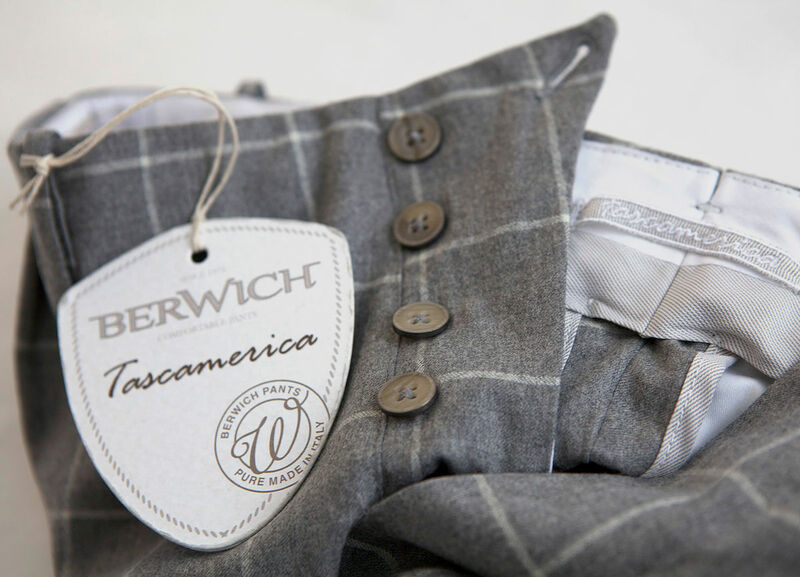 In the 2007 the company creates its own label of trousers: BERWICH-pure made in Italy, a collection that has the travelling and exploration charming as main topic. To explore means the searching for, one of the success reason of this brand. Leaving, Travelling, Discovering are valid action that build new business projects, just like the company brand. Berwich is distributed according to selecting standard and partnership with all retailers. The brand is in national and international markets. In spite of the off-sourcing general trends followed by many Italian companies, ICOMAN focuses its business inside the same company. The company has the entire producing process inside its area, without relocating and thanks to the precious contribute of almost 100 employees. The fusion between high technology and tailoring tradition guarantees the producing efficiency and the quality, all inside the lab. The style is internally edited, created thanks to creativity staff: all Berwich items are famous, unmistakable, tailored with excellent fabrics, trendy fits, refined details, elegantly packaged. The attention for details is the style team’s main purpose: they take care of cottons, mix of cottons, quality of stitching and accessories. Nothing is casual. Bruno Manetti is the brand name of the same named company, belonging to the Manetti family. The brand was incorporated in the mid ‘90s when Bruno entered the family company and decided to develop his own collection. Inside the company, immersed in the splendid Tuscan hills, expert craftsmen combine their traditional manual skills with last generation technology in this sector. 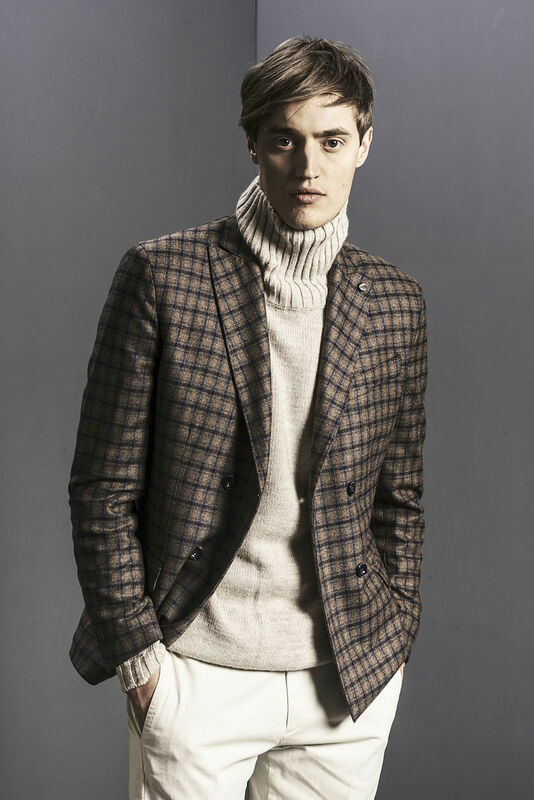 Bruno Manetti Cashmere is one of the most valuable, natural fibres with unequalled characteristics. It has always been known as the “fabric of the gods” not only for its sensual touch, but also for its extremely warm, lightweight structure. 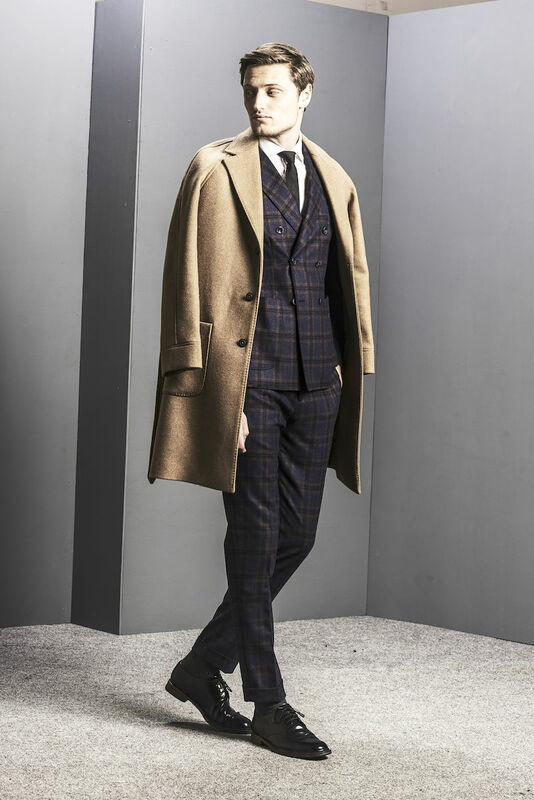 Laboratori Italiani is a menswear fashion brand that recalls the quintessence of creativity, the taste of made in Italy and the elegance that revokes tones both in classic and modern keys. The whole collection shows a contemporary style addressed to the modern, cool and refined man who loves to wear sophisticated looks and lines. The companies has built a cospicuous distribution channel which covers not only Italian territories but also Europeans and Asian countries such as Japan. 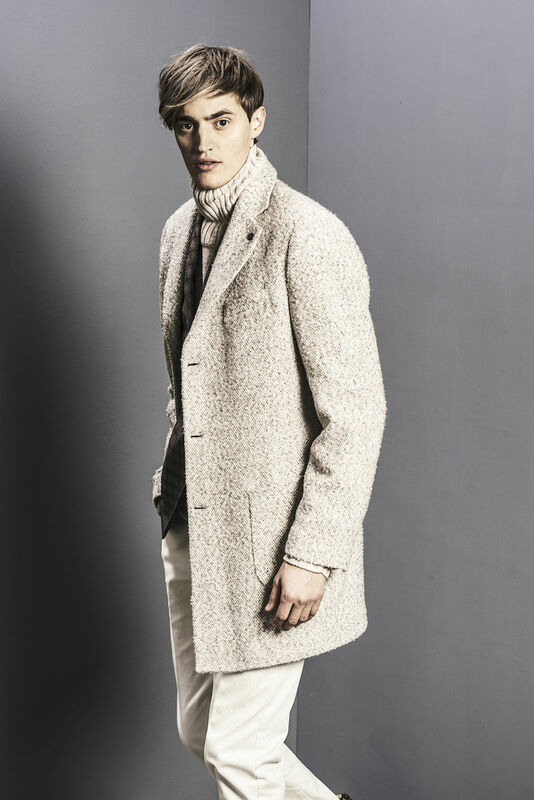 The collection is a total look made of precious outwear, knitwear, shirts, suits and trousers. 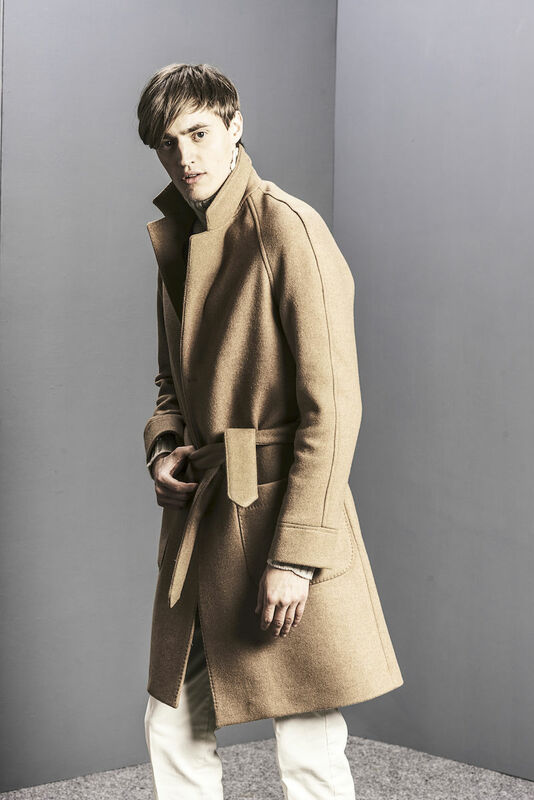 Cotton, Virgin Wool, cashmere in tenuous nuances inspired to the colours of the earth like warm brown and beige are the main selected fabrics. 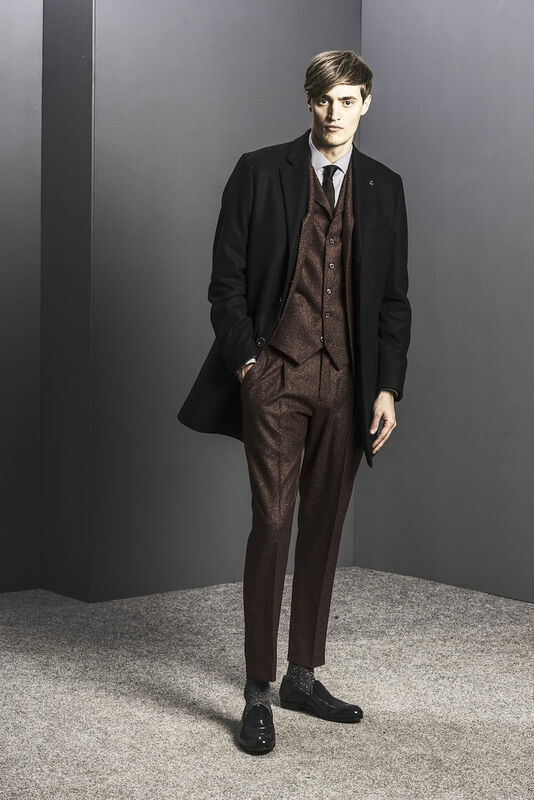 The result is a perfect mix between the old sartorial neapolitan taste and the elegance of the traditional british style. At the same time, pieces such as denim and dyed garments complete the collection giving it a more urban style. All the marked but the simple details, like black leather patches personalised buttons and visible stitches show the new absolute dandy charm of Laboratori Italiani. The production chain is completely made in Italy, from fabrics to manifactures. 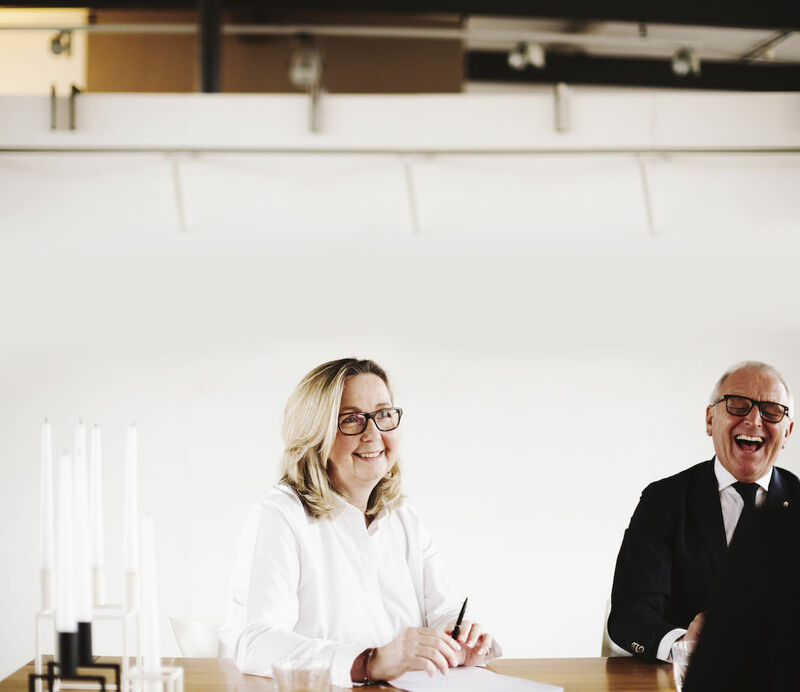 In 1983, Marion and Roland Buhrs founded buhrs 3.0 agencies, a fashion agency that today is among the leading representatives of innovative fashion brands. In 2005, Anna Buhrs-Kühner joins the company management. The three CEOs are supported by their professional and committed sales team. 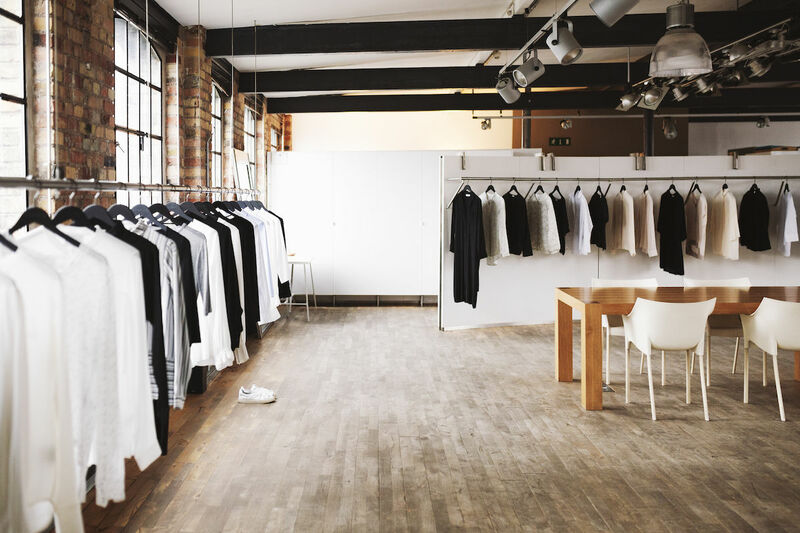 buhrs 3.0 agencies is divided into a womenswear- and a menswear-department; Marion Buhrs and Anna Buhrs-Kühner are in charge of womenswear, and Roland Buhrs represents menswear. In our headquarters close to Frankfurt, as well as in our showrooms in Düsseldorf, Berlin, Hamburg and Munich, our customers find a great selection of exciting European brands with a high potential for identification. In addition, we present our portfolio on all important international trade fairs. Based on our consistent claim on quality and professionalism, we maintain transparent and loyal business relations with our sales partners. They trust in our sales expertise, our comprehensive know-how and reflected, honest assessment of the collections. 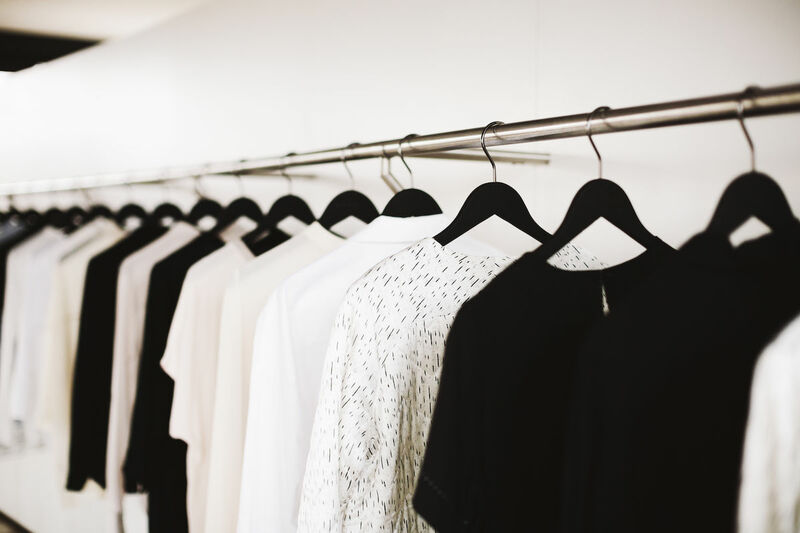 Our personal passion is to consult ambitious young labels, supporting and guiding them in optimizing their concepts, in their launch and establishment on the market. We engage in a continuous, intensive dialogue with leading retailers that rely on an open communication, our long-term experience and competence in trends, the exciting and diversified brand mix, as well as on our understanding of service. Die Verarbeitung der per E-Mail übersendeten Daten erfolgt auf Grundlage des Art. 6 Abs. 1 lit. b DSGVO, sofern Ihre Kontaktierung auf den Abschluss eines Vertrages abzielt. Zusätzliche Rechtsgrundlage für die Verarbeitung der Daten ist unser berechtigtes Interesse an der Beantwortung Ihrer Anfrage gemäß Art. 6 Abs. 1 lit. f DSGVO. Die von Ihnen per E-Mail übersendeten Daten verbleiben bei uns, bis Sie uns zur Löschung auffordern, Ihre Einwilligung zur Speicherung widerrufen oder der Zweck für die Datenspeicherung entfällt (z.B. nach abgeschlossener Bearbeitung Ihrer Anfrage). Zwingende gesetzliche Bestimmungen – insbesondere Aufbewahrungsfristen – bleiben unberührt. Wir unterhalten Social-Media-Präsenzen (Fanpages) in sozialen Netzwerken und Plattformen, um auf diesem Weg mit Kunden, Interessenten oder sonstigen Nutzern, die in dem jeweiligen sozialen Netzwerk und Plattform ebenfalls tätig sind, interagieren zu können, so dass wir unser Angebot verbessern und für Sie als Nutzer interessanter ausgestalten und sie über unsere Angebote und Leistungen informieren zu können. Rechtsgrundlage für die Nutzung der Social Media Präsenzen und der damit verbundenen Verarbeitung der personenbezogenen Daten der Nutzer ist Art. 6 Abs. 1 S. 1 lit. f DSGVO. Der dahinterstehende werbliche Zweck und das Interesse an einer effektiven Information der Nutzer und Kommunikation mit den Nutzern sind als berechtigtes Interesse im Sinne der DSGVO anzusehen. Die Verantwortung für den datenschutzkonformen Betrieb ist durch deren jeweiligen Anbieter zu gewährleisten. Sollten die Nutzer von den jeweiligen Anbietern der Social Media Plattformen um eine Einwilligung in die Datenverarbeitung gebeten werden (d.h. das Einverständnis wird bspw. per Opt-In-Verfahren z.B. über das Anhaken eines Kontrollkästchens oder Bestätigung einer Schaltfläche erklärt) ist die Rechtsgrundlage der Verarbeitung Art. 6 Abs. 1 lit. a., Art. 7 DSGVO. Wir müssen Sie darauf hinweisen, dass hierbei die Daten der Nutzer außerhalb der Europäischen Union verarbeitet und verbreitet werden können. Aufgrund dessen können für die Nutzer dieser sozialen Medien und Plattformen gewisse Risiken bestehen, wie bspw. bei der Durchsetzung der Betroffenenrechte. Die damit verbundenen eventuellen Risiken für die Benutzer können wir als Betreiber der Social Media Präsenzen nicht ausschliessen. Die US-Anbieter sozialer Medien und Plattformen, die sich dem EU-US-Privacy-Shield (https://www.privacyshield.gov/EU-US-Framework) unterworfen haben, geben damit die Zusage, die Datenschutzstandards der EU anzuerkennen und einzuhalten. In der Regel werden die Daten der Nutzer von den Anbietern der sozialen Medien und Plattformen zum Zwecke der Werbung, Marktforschung und bedarfsgerechten Gestaltung der Anbieter-Seiten genutzt. Es können beispielsweise von den Anbietern Nutzungs-, Interessen- und Beziehungsprofile erstellt werden, die zur Erstellung personalisierter Werbung, d.h. Werbung, die mutmaßlich den Interessen der Nutzer entspricht, verwendet werden kann. Die Anbieter setzen zur Speicherung und weiteren Verarbeitung dieser Informationen in Regel Cookies ein, also kleine Textdateien, die auf den verschiedenen Endgeräten der Nutzer gespeichert werden. Insbesondere wenn der Nutzer ein Profil auf der Social Media Plattform des jeweiligen Anbieters besitzt und in diesem Profil eingeloggt ist, erfolgt die Speicherung und Analyse auch geräteübergreifend. Wir haben weder Einfluss auf die erhobenen Daten und Datenverarbeitungsvorgänge, noch sind uns der volle Umfang der Datenerhebung, die Zwecke der Verarbeitung, die Speicherfristen bekannt. Auch zur Löschung der erhobenen Daten durch die Anbieter liegen uns keine genauen Informationen vor. Da nur die jeweiligen Anbieter der Social Media Plattformen den vollständigen Zugriff auf die Nutzerdaten hat, empfehlen wir Ihnen, sich direkt an die Anbieter zu wenden, wenn Sie Auskunftsanfragen oder sonstige Nutzerrechte (z.B. Recht auf Löschung) effektiv geltend machen wollen. Sollten Sie dennoch Hilfe benötigen, dann können Sie sich an uns wenden. Instagram (Instagram Inc., 1601 Willow Road, Menlo Park, CA, 94025, USA) – Datenschutzerklärung / Opt-Out: http://instagram.com/about/legal/privacy/ . • gemäß Art. 77 DSGVO sich bei einer Aufsichtsbehörde zu beschweren. In der Regel können Sie sich hierfür an die Aufsichtsbehörde Ihres üblichen Aufenthaltsortes oder Arbeitsplatzes oder unseres Kanzleisitzes wenden. Eine Liste der Datenschutzbeauftragten sowie deren Kontaktdaten können folgendem Link entnommen werden: https://www.bfdi.bund.de/DE/Infothek/Anschriften_Links/anschriften_links-node.html. Sofern Ihre personenbezogenen Daten auf Grundlage von Art. 6 Abs. 1 lit. e oder von berechtigten Interessen gemäß Art. 6 Abs. 1 S. 1 lit. f DSGVO verarbeitet werden, haben Sie das Recht, gemäß Art. 21 DSGVO Widerspruch gegen die Verarbeitung Ihrer personenbezogenen Daten einzulegen, soweit dafür Gründe vorliegen, die sich aus Ihrer besonderen Situation ergeben oder sich der Widerspruch gegen Direktwerbung richtet; dies gilt auch für das Profiling, soweit es mit solcher Direktwerbung in Verbindung steht. Im Fall der Direktwerbung und Profiling haben Sie ein generelles Widerspruchsrecht, das ohne Angabe einer besonderen Situation von uns umgesetzt wird. Wenn Sie widersprechen, werden Ihre personenbezogenen Daten anschließend nicht mehr zum Zwecke der Direktwerbung verwendet (Widerspruch nach Art. 21 Abs. 2 DSGVO). Möchten Sie von Ihrem Widerrufs- oder Widerspruchsrecht Gebrauch machen, genügt eine E-Mail an contact@buhrs.de. Durch die Weiterentwicklung unserer Website und Angebote darüber oder aufgrund geänderter gesetzlicher beziehungsweise behördlicher Vorgaben kann es notwendig werden, diese Datenschutzerklärung zu ändern. Die jeweils aktuelle Datenschutzerklärung kann jederzeit auf der Website unter https://buhrs.de/datenschutz von Ihnen abgerufen und ausgedruckt werden.